The "Cathedral Shrine of the Virgin Guadalupe" or "Cathedral Santuario de Guadalupe" historic church structure dates back to the late 19th century. It's proximity to the Arts District in Dallas, Texas makes it a popular venue for wedding photography in DFW. 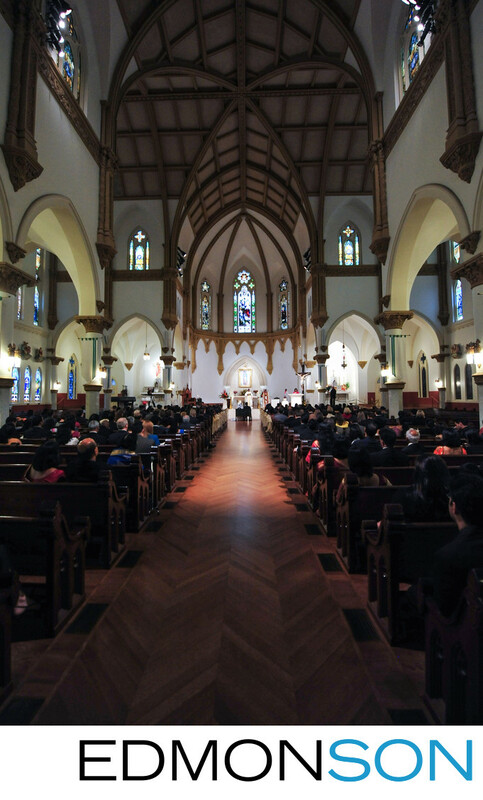 This Indian aka South Asian bride & groom are shown seated as the priests conduct the liturgical portion of the ceremony surrounded by family members and guests with impressive stained glass windows and vaulted ceiling. The process of planning your Catholic wedding ceremony at the Cathedral Virgin of Guadalupe Shrine starts by visiting the church located at 2215 Ross Avenue Dallas, TX 75201 or calling 214-871-1362. To reserve your wedding date and time, complete your initial interview with a Cathedral priest or deacon and pay your deposit. A specific appropriate attire requirement for your wedding party includes no bare shoulders. Besides the initial interview, you can expect to participate in the wedding rehearsal, customize the Liturgy to include readings by your family members or friends, make arrangements for music including an Organist, Cantor/Vocalist, Mariachi or musicians including Violins, Trumpets, or Flutes. Fresh floral arrangements are allowed in the main sanctuary as well as wedding photography. Of course, good Dallas wedding photographers know that a wedding is a sacred covenant and that during a religious service show proper respect for the ceremony and space. Photos are allowed inside the church up to 30 minutes before the wedding as well as outside. During the ceremony, the photographers are to minimize any noise or distracting movements and remain outside of the elevated areas. Afterward, the wedding party can return to recreate any significant parts of the ceremony that might benefit from an alternative angle. There are no photographs allowed from the Choir Loft in the back so plan on any wide shots to be captured from the ground floor. Family members and friends are welcome to have their picture taken with the bride and groom following the conclusion of the event. Location: 2215 Ross Ave, Dallas, TX 7520. 1/100; f/4.5; ISO 2000; 14.0 mm.